The overall household benefit cap aims to limit social security expenditure by reducing some out-of-work households’ housing benefit to ensure that overall benefit income does not exceed a nationally set level. The benefit cap was first introduced in 2013. It placed a limit on the total amount of benefit that most out of work people between 16 and 64 can receive a week to £500 for a family or £350 for a single person without children. The Welfare Reform and Work Act 2016 reduced the level of the cap to £23,000 per annum (£442.31 a week) for a family or lone parent in Greater London and £15,410 (£296.35 a week) for single childless claimants. Outside of London the rate is £23,000 for a families and £13,400 for single claimants. The cap applies to child benefit, child tax credit, jobseekers allowance, employment and support allowance and housing benefit. If any member of a household receives working tax credit or certain other disability or sickness-related benefits, then the cap will not apply to that household. The benefit cap has a particularly marked effect in London due to the capital’s high rents which lead to large housing benefit claims. The large number of London households capped (and the larger reductions they experience) is placing borough homelessness and housing options services under pressure. London Councils supports a benefits system that makes work pay. That means a system that takes into account London’s higher costs. London Councils has lobbied for London’s unique circumstances to be recognised in the design of the benefit cap and the support given to boroughs to implement it. In April 2017 London Councils submitted evidence to the Work and Pensions Select Committee’s inquiry into the Benefit Cap. 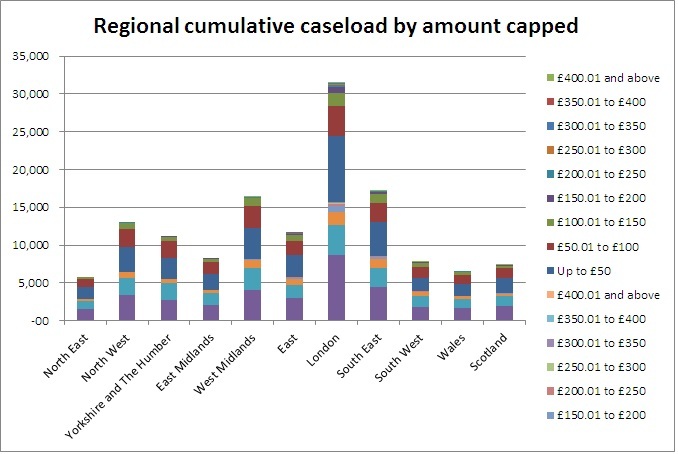 The submission explains the disproportionate impact of the cap in London and sets out how it has placed significant pressure on local authority budgets while also increasing demand for local support services. Discretionary Housing Payments are an essential tool for local authorities to mitigate the impact of the cap and drive positive outcomes for capped households. However the current Discretionary Housing Payment model under-funds London, where housing pressures are most acute. London Councils continues to make the case for London to receive its fair share of Discretionary Housing Payment funding. The Department for Work & Pensions publishes statistics on the number of households that have been capped at any point, along with the most recently recorded outcome for each capped household. The chart below shows how the number of capped households in London has changed over time. The chart below shows how London households tend to see their benefit income reduced by greater amounts than households in other regions.